The syllabus is an area where you can post your course syllabus with instructor information, course requirements, expectations and more. It is a convenient place for this information so students can view it at any time. Enter the Syllabus area by clicking on Syllabus in the left menu bar. If it’s not available yet, you can enable it under Edit by Tools, in Site Setup. If no syllabus entry has yet been created, your page will be empty except for a View and Author menu options at the top of the page. Click on Author and then on Add to begin adding items to your new Syllabus. In the dialog box, enter a title for the syllabus item that you want to compose. Then add content in the large white content box. You can type from scratch here, or you can copy and paste text you have already created in a word processor, such as MS Word. Choose if you want the syllabus to be available to anyone browsing (Public View = Yes), or just available to students enrolled in the course (Public View = No). You may upload attachments to your Syllabus, if you wish, at this point. Click on Done to have the syllabus published in Etudes for viewing, click View if you want to preview what it will look like in the student view before you post, click Save Draft if you are not finished and plan to return later to make further revisions, or click Cancel to leave the page without saving anything. Continue adding syllabus items. 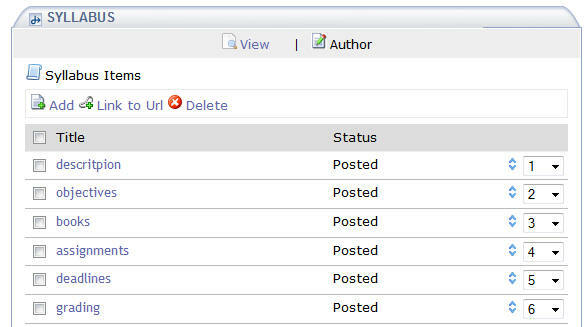 Each time you want a title/header over a section, you need to “Add” a new syllabus item by clicking on the “Add” button. Click on the View link at the top of the syllabus list page to switch to the student view. To edit any items in your syllabus, click on the Author link at the top of the page. From the list of syllabus items, click on the title of the section you want to edit. You can also reorder your Syllabus sections by holding down a row (item) with the mouse and dragging and dropping it to the new location. Don’t forget to click on Save at the bottom. You may also sort items by using the numeric pull-downs on the far right. To remove a syllabus item, check the box to the left of the item in the list and then click on the Delete button at the action menu bar. You can use an existing web page as your syllabus instead of creating individual sections as described above. For example, if you have a syllabus published somewhere else on the web (i.e. your institution’s faculty website), you may choose the “Link to Url” option (under Author) and point the Syllabus tool of Etudes to that page that’s all created. Enter the Syllabus by clicking on Syllabus in the left menu bar. If necessary, click on the Author button. Click on the “Link to Url” link. In the dialog box, type in the web address of your syllabus page. If the URL is http (as opposed to https), check ‘open in new browser window’. Click on Save to set this web page as your syllabus; click Cancel to leave without saving that change; or click on Delete to remove the URL redirect. If you click on Done, your syllabus now will point to this web address. If you had authored any syllabus items, they will no longer be visible to students. Instead, the syllabus will be directed to the web page that you added. To preview it, click on the View link at the top. If you decide not to use this web page anymore, you can remove it. Click on Author and then on Delete Url. The Syllabus Tool can be imported from an old site into your new term’s site. You do this in Site Setup >> Import from Site. Syllabus tool needs to be turned on in both the old and new sites. At the very bottom of the Syllabus (student view), students are presented with an agreement to accept the syllabus, as in the following. Etudes adds this button and agreement to all Syllabi. You need not do anything special for this button to appear. Activity Meter records the date students accept the syllabus. At the top of the Syllabus view in Activity Meter, you will see the % of enrolled students who have accepted your syllabus. You will also see the date that the syllabus was accepted by each student or a dash if it was not yet accepted. You may send a Private Message (PM) to the students who have not accepted the syllabus from Activity Meter.